World Armwrestling Cup Zg Strong is ex-Sokol Maric, right? Tell its history, please? 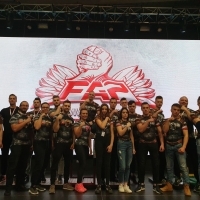 – Croatian armwrestling federation is young, it was found in 2009. We have 15 clubs over the country and we are members of National Olympic Committee. Every year from we try to hold one international tournament. The first one was in 2010, 2 or 3 countries took part there. In 2014 we organized Sokol Maric International Armwrestling Cup firs time. The championship was named after one of our partners – security agency “Sokol Maric” and we have also several other partners there. Usually the tournament was held at the first weekend after Labor Days in May in the central square of Zagreb. It was great idea for armwrestling promotion because at that time, there were a huge amount of people and they could watch our championship. At the last championship, we had two special stages – one was for sportsmen and another for spectators. But things happened that way that one of our sponsoring company got bankrupt last year but we found new partners. Here we understood that we made a mistake when we gave to the tournament a name of partner company. Because now we change it and we have to start almost from the very beginning, but the championship already has good reputation and some authority. So we decided to name our competition World Armwrestling Cup Zg Strong, using a prefix Zg for Zagreb. This time Zg Strong will pass at the Westin Zagreb hotel and it’s relaxing me a lot because 10 days before the championship last time we checked the weather forecast every hour. Now we don’t care about the weather, only about championship. Also it is important that we made a great advertisement campaign for Zg Strong – TV ad, billboards, graphics. We’ll have almost two hours of broadcasting at the local TV. You will award Open class winners with… diamonds! – It’s true. One of other sponsors is jewelry company “EPL Diamonds” that provide us with great prizes. We have three diamonds at stake. First one is for ladies category, because, you know, ladies like diamonds (smiles – auth). It is worth 1000$. And two other are for men open classes – they are worth 2500$ each. Besides, we have great prize budget. Coming closer to participants – whom do you expect to see at the championship? – This time we expect to see many sportsmen from all over the world. For example, we already have Kazakhstan’s application – they will bring at least one sportsmen in each weight class. We’ll see Brigitta Ivanfi from Hungary, Lucia Debnarova and Rebecca Martinkovičová from Slovakia and other great ladies. In men classes – Viorel Dobrin, Hristo Delidjakov, Sasho Andreev (who is my favorite for win in the open class right hand), Mirtaleh Aslanov, Frank Lamparelli, Medet Kuttymuratov. Unfortunately, we won’t see Ermes Gasparini because he got injury during Italian nationals. In spite of the number of participants, I want to wish good luck for everybody! We invite you to watch the best fights of World Armwrestling Cup Zg Strong at the armbets.tv. Join the strongest!